EXtendiaIT is proud to announce the launch of eXtendiaIT.com, with multi-lingual IT service solutions for Application Development, Asset Management, Legacy Systems, Electronic Transaction and other services all tailored with Legacy Technology, New Technology and Mobile Development. EXtendiaIT is launching a new website to make available reliable and efficient business information technology solutions that will drive firms to achieve more and reach anticipated targets in their specified window period. Customers are consistently complaining about the poor services rendered today by businesses of various types, and businesses are running to every corner of the economy looking for time-saving and cost-effective solutions to these problems. EXtendiaIT realizes the need of providing 21st century information technology services in order to retard and reverse the economic downslide which is affecting every socio-economic level. We understand there is little room or capital as the case may be for “trial and error” approaches to IT solutions. So EXtendiaIT.com offers a complete range of solutions that will meet the information technology challenges of any company. EXtendiaIT.com has a very user friendly interface for its website navigation. With straightforward categories listed on its home menu, available sections to present your business intent on the left pane, send an official email and talk to eXtendiaIT personnel (24 hours a day, 7 days a week) on the left pane and leave feedback for the staff on the right pane. Technology: This section includes Legacy Technology support services (to provide IT support for companies that continue to use legacy systems), Newer Technologies (to provide all the up-to-date IT services and solutions to businesses, and Mobile Development Technologies (seeks to provide advanced solutions on some of the high tech “on-the-go” devices that have taken a solid space in the daily life of the average people today). 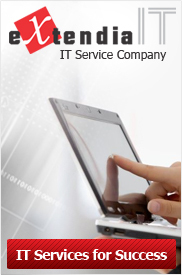 Services: shows the details of all the IT solutions eXtendiaIT has to offer. Success Stories: Names some businesses and their particular IT challenges that have been handled by eXtendiaIT solutions and services. © Copyright 2013. ® All Right Reserved.